• Unscrew the top and bottom chambers. Remove the coffee basket and fill the lower chamber with cool water. Fill to the bottom of the safety valve which is visible from the inside and outside of the lower chamber. • Place the coffee basket inside the lower chamber and fill with medium to coarse grind coffee. If you use fine coffee the pot will not work. • Firmly screw the two halves together. • Place on the stove on a medium flame. The flame should not shoot up past the bottom of the pot. • Finally, check the upper chamber after 4-5 minutes, once the upper chamber is filled immediately remove the pot from the stove and serve. 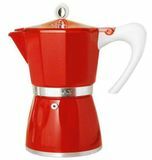 • Leaving a stove-top maker on an open flame with no water in the bottom will cause the pot to reach such a high enough temperature that not only will your scald the coffee in a matter of minutes but you will also burn the gasket used to connect the two halves.